Celine and Piers had their wedding reception at The Dorchester. Needless to say we’ve wanted to film there for a very long time, so were really excited when Celine and Piers went ahead and booked with us. Celine and Piers’ ceremony took place at St Yeghiche Armenian Apostolic Church. 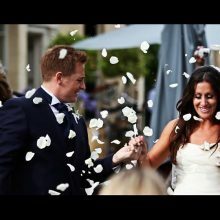 Armenian wedding ceremonies have several lovely, distinctive rituals, which are really interesting to film, making the ceremony part of the wedding video a lot more varied than usual. After the ceremony Ben went off with Celine and Piers to Hyde Park, and various other spots in London, to get some couples shots. Luck must have been on our side that day because the light was perfect and the shots look incredible. So that brings us to the reception… with the decorations and details that they chose. The blue light of the room was complemented perfectly by the clusters of white roses atop each centerpiece and by the diamante studded photo frames chosen for favours. Also, I’ve never seen a cake quite like Celine and Piers’ one, a white silk bowl wrapped around a gigantic pyramid of white frills, it looked like something you’d be afraid to cut into – but I bet it was delicious when they did. This was our first experience of an Armenian wedding, and I really hope it’s not our last!! We loved every bit of it. 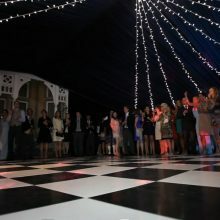 In the evening the wedding party really came to life with endless energetic dancing (if it was me I wouldn’t have lasted 5 minutes – I had a hard enough time just filming it! ), the perfect end to a perfect day.